The Little Red Lighthouse provides great view from the end of the marina break wall. The break wall can be accessed through the Alpena Marina and also provides specatcular views of Lake Huron as well as a great spot to fish along the shore. 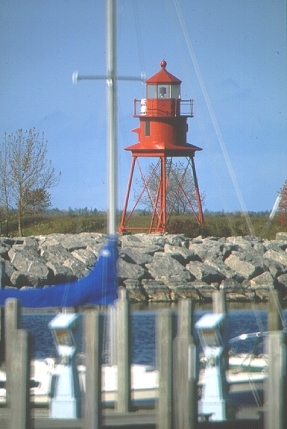 While the Alpena Light may not be a typical lighthouse, it does meet the criteria to be called one. Located at the mouth of the Thunder Bay River, the 80-foot skeletal tower is best viewed from the transient docks at the City of Alpena's Marina. Called "Sputnik" (resembles the Russian space satellite) and "Little Red" by locals, it is said this oft dismissed light is "Long on duty, short on beauty." Believed to be the only lighthouse of this type in the U.S., the station was built of wood in 1877, rebuilt of wood in 1888 and finally constructed of steel in 1914. An automated active aid to navigation, the Alpena Light originally housed a Fourth Order Fresnel lens.